TheCostumeShop is dedicated to providing our customers with the best service possible! 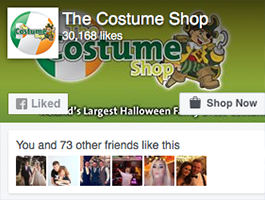 We strive to maintain TheCostumeShop.ie as the first choice for Fancy Dress Costumes in Ireland. We work closely with world leading experts in costume design, online technology and security to provide you with an easy to use, fully interactive and secure shopping experience. If the costume you chose does not fit or does not look great on, you can return it within 7 days for a full refund or in exchange for a different costume. Great low prices and tens of thousands of costumes in stock - all year round, ready to ship. With over 10,000 square feet of warehouse space and over 600,000 costumes in stock ready to ship, we are Ireland's biggest Online Fancy Dress Costume Shop according to both Alexa and Google - with our superior service we blow the competition away. We are aware that it is a coveted status with other websites trying to claim it as their own. We believe in honesty, integrity and fair prices for our customers that is why we are number one. If you have any questions or queries about any of our products please do not hesitate to email or call us. We are here to help! If you have a particular costume in mind and you cannot find it on our site, let us know and we will do our best to get it in for you.